Flutist with lots of successful happy students! I hold a Bachelor's of Music degree from the University of North Texas, and a Master's of Music degree from Catholic University of America in Washington D.C. I have taught on the Woodwind Faculty at Peabody Preparatory, Salisbury University, Anne Arundel Community College, and The U.S. Naval Academy. 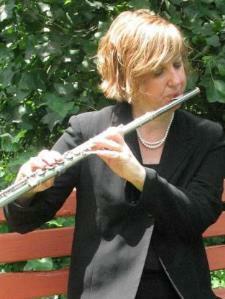 I have played flute with a wide variety of orchestras and ensembles in the Maryland area. I have given international solo performances in New Delhi, Paris, Antwerp, and Monterey. I I enjoy teaching students of all ages and experience levels. I concentrate on the positive aspects of your lesson preparation, while pointing out potential ways to improve your practice time. I will cover all styles of the classical flute repertoire, from Baroque literature to contemporary. My students have been member of the Maryland All-State Band and Orchestra. Several of my students have had the opportunity to play with the Baltimore Symphony Orchestra on Side by Side Concerts. My lesson style is positive and encouraging. My goal is to help you learn to love playing the flute to the best of your ability. I am currently attending Texas Tech University, where I am pursuing a Doctorate in Musical Arts. I enjoy living in Lubbock, and look forward to meeting you at your first lesson! Catholic University of America in D.C.
Melinda hasn’t set a schedule. I have my Bachelors and Masters in flute performance. I am currently working on my DMA at Texas Tech University. I have taken advanced studies in Music Theory and Kodaly Methodology. My minor at University of North Texas was in Music Theory.